Developing a new habit is hard. Many of us go through the same cycle each year after making a New Year’s Resolution. We set a lofty goal, make some progress for awhile, and then eventually fall off the wagon and go back to our old ways. What if this goal-based method of changing was setting yourself up to fail? Many behavioral scientists recommend a different approach. Instead of setting that lofty goal, they would recommend instead to focus on making sure you put in the daily effort needed to get there. In other words, focus on the inputs instead of the outputs to create lasting habits that result in achieving your goals. A few years ago I got my first prescription - for an allergy medication. I had just gotten a new puppy and I found out that I had moderate allergies that flared up around her. I spent hours of my time and hundreds of dollars going to the doctor. But there was still a problem. Although I could take them occasionally, I couldn’t take the pills regularly. I couldn't train myself to develop a new habit. The 3 R's of the Habit Formation Loop. Reminder. Routine. Reward. It turns out that I’m not alone. On average, Americans take their prescription medications only about 50% of the time. This is called “Medication Non-Adherence” and according to researchers it leads to about 125,000 premature deaths per year in the U.S. There are no statistics for vitamins but I’m guessing that the number is even lower than that. The reality is that although your doctor may tell you to take your medications every evening at bedtime for the next year, they aren’t giving you the daily support that most people need to build a new habit. It’s a nice goal, but there is little support given in how to get from the goal to building the habit. It’s not your doctor’s fault... they just don’t have the time. This pattern was described by NY Times Bestselling author Charles Duhigg in his book, “The Power of Habit.” James Clear then expanded on Charles’s work and came up with the term “The 3 R’s of Habit Change.” If you’re interested in this topic or if you have a habit or two that you want to improve, then I would highly recommend reading their work. 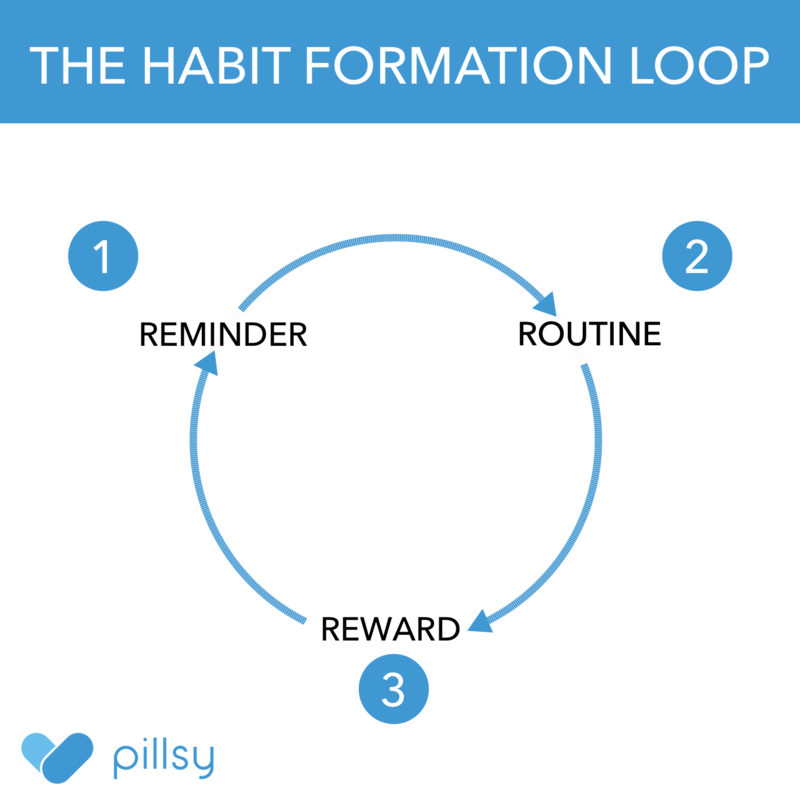 Pillsy follows the principles of the Three R's to help develop habits around taking your pills correctly. Pillsy was designed with people who take 1-7 pills in mind, although the app can be used with an unlimited number of smart pill bottles. Here are some additional behavioral science theories that could also be applied to Pillsy. If you plant the right seed in the right spot, it will grow without further coaxing. I believe this is the best metaphor for creating habits. The “right seed” is the tiny behavior that you choose. The “right spot” is the sequencing - what it comes after. The “coaxing” part is amping up motivation, which I think has nothing to do with creating habits. In fact, focusing on motivation as the key to habits is exactly wrong. Let me be more explicit: if you pick the right small behavior and sequence it right, then you won’t have to motivate yourself to have it grow. It will just happen naturally, like a good seed planted in a good spot. According to Dr. BJ Fogg, triggers (i.e. reminders) work best when somebody is motivated and when the task is not extremely difficult to complete. Taking a pill is a great example of a behavior where triggers can be very effective. Dr. Fogg's Behavior Model shows that three elements must occur at the same moment for a behavior to take place: Motivation, Ability, and Trigger. When a behavior does not occur, at least one of those three elements is missing. We believe that most of our users have sufficient motivation and ability - Pillsy provides the necessary trigger to make sure that the behavior happens. People are the sum of their daily habits, not their goals. Nobody says, “I want to be overweight”, but obesity has reached an epidemic proportions in the U.S.
fitness will naturally follow. A goal can provide the motivation to develop a habit but goals without a plan for achieving them are almost worthless. Champion athletes and expert musicians understand this best. Many of the best athletes have developed stringent routines that they stick to no matter what. Michael Phelps once won a race while swimming with his eyes closed; his training habits became so ingrained that even winning a big race had become automatic. Our daily routines fuel our health or sickness, depending what they are. The problem is, marketers are constantly providing triggers to try to get you to develop the habits they want you to have. Tobacco, alcohol and fast food marketers show ads to try to trigger cravings that drive you to buy their products. Tech companies like Facebook and Twitter try to get you to opt into notifications that pull you back into their websites or apps, where you’re rewarded by engaging with your social network (and hopefully looking at a few ads in the meantime). If there are certain habits that you want to develop for yourself then it's important to engineer healthy reminders and routines to fuel these habits that support your healthy goals. When you stop you are as empty, and at the same time never empty but filling, as when you have made love to someone you love. Nothing can hurt you, nothing can happen, nothing means anything until the next day when you do it again. It is the wait until the next day that is hard to get through. There are a couple things to note here that Ernest revealed. He developed a habit of producing great writing around a trigger (waking up, seeing the first light), when there were no external distractions. Writing was the desired action and there was an emotional reward, when he read what he had written. Importantly, he repeated this each day, not on days where he felt most motivated, so as not to break the habit. Even as he was known for an adventurous, spontaneous lifestyle that was peppered with alcoholic binges, he created a habit loop that enabled him to become an incredibly productive and prolific writer. But there is another phenomenon around habits that’s also very interesting, which is that adhering to one positive habit may actually you stick to other good habits. I notice this personally with diet and exercise. On days where I get in a better-than-average workout I also feel more desire to eat healthy. James Clear, who noticed the same pattern between his own diet and workout regimen calls your cornerstone habits “Keystone Habits”. In that way, taking your vitamins or medications may support that you have an identity of “somebody who takes care of their health”. This could lead to other positive, healthy behaviors, such as exercising, eating well, or getting a checkup with your doctor on a regular basis. Our goal with Pillsy isn’t to replace these other positive habits with magic pills to keep you healthy. Instead, we’re aiming to provide support with maintaining one of the important habits that impact your health so you can have additional focus and energy to dedicate to the other ones. By taking control of your vitamin or medication habit, it actually frees up mental bandwidth to also conquer additional habits. ke control and to manage this part of their health. We hope that by helping a lot of people win more of the little moments we can help them to make a big impact on their health. Copyright © 2018 Pillsy, Inc. All Rights Reserved.